29th November – Former World 10,000m champion and three times World Cross-Country silver medalist Linet Masai (KEN) gave further indication that she is returning to her best with a dominant display at the 34th edition of the Cross Internacional de la Constitucion in Alcobendas. Linet looked in complete control as she strode away from the field throughout the race to build a winning margin of over 30 seconds. 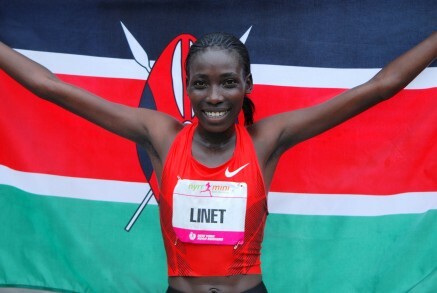 This was second time Linet has tasted victory in Alcodendas after she won in 2008 when still a junior. Timothy Toroitich (UGA) was not able to defend the title he won last year but he did add yet another podium finish to his CV. Timothy and Ethiopian rival Tamirat Tola broke from the field but a stumble which caused him to twist his ankle 2kms from the finish dashed Timothy’s hopes of victory. However, he did battle through to the finish to secure second place. At the British trials for the European Cross-Country Championships, both Tom Lancashire (GBR) and Stephanie Twell (GBR) earned automatic selections for the team. In muddy, wet and energy sapping conditions both gave strong performances that saw them finish in third place in the mens and womens races respectively. On the road at the Delhi Half-Marathon, Moses Kipsiro (UGA) improved his personal best to 60:41 which gave him eighth position in a very strong field.